I'm considering getting a bar bag for use whilst touring. I don't intend carrying bricks, small cattle or weighty tomes, just a phone, wallet, first aid kit etc. Reading around the topic there seems to be a debate about using one at all. Some say that a barbag interfers with steering, balance and that it can crowd out handlebar space. Others think they are great for carrying bits and bobs and for being a great map and snack holder. If you're a barbag user which one do you use? Ortlieb, Vaude, Carradice? Ortlieb ultimate 6, great kit. I carry largish/bulky but not heavy things in mine when possible so as to have minimal affect on handling. It is also my valuables repository so is never left on the bike and comes with me when I leave. It is stowed in the footbox/tail cone of my tent when I sleep. It also carries my electronics while they're being charged by my dybohub charger. Very handy that and waterproof as well. I bought the Ortlieb Large HB bag because for about the extra weight of an aspirin tablet, I have another 1.5l of capacity, nice for stowing a wind shell or similar. A real key to avoiding handling problems with a HB bag is minimizing weight carried in it, but almost as important is making sure the weight is carried as low as possible and as close as possible to the steering axis. This is where Thorn's Accessory T-bars are of such great use. They come in 55mm and 105mm forward extensions. I settled on the shorter for my needs 'cos the forward extension of the Ortlieb bracket made up the difference. Hopefully helpful as another data point. Carradice super C for me. Only has a 5ltr capacity, but that's enough for my pass through battery, valuables and some snacks - never stays on the bike always with me. I have an ortlieb ultimate 4. Works well with some caveats. If it’s not full things rattle inside, if it is full it makes the steering heavier and the front end can swing around alarmingly when parked. The heavy steering is not a big problem you just adjust. I don’t like the bracket that is pretty much permanently fixed to the bike. The cable that supports it isn’t easy to reuse often. 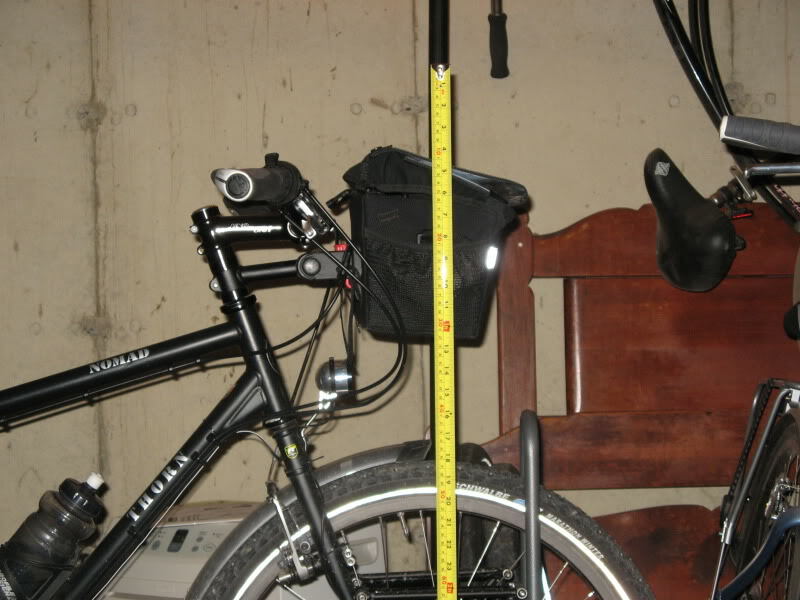 I would probably switch to something that buckles onto the wall bars like a carradice but then it’s harder to take indoors with you and I like to use the map pocket on the ortlieb. So I’ve not found the perfect solution yet. Agree with everything Dan said for the use of a bar bag. For example, I carry spare sunglasses, but they have almost no weight, so they are as far forward in teh bag as practical away from steering axis, heavier stuff like granola bars or or electronics are in the back (stern) to be closer to the steering axis. I have two bags that I often use, both are out of production and I modified both, so you are not going to find any like them. Made by Louis Garneau before I started modifying them. I use the 55mm Thorn accessory bar on my Nomad (first photo). On three other bikes I use a second stem to mount the bar bag lower and also to not consume valuable handlebar space (other photos, third photo note that I use an adjustable stem to get the mount even lower and closer to the steering axis). You will notice the handling change with or without the bar bag, but it all depends on how much you put in it. i just leave my ortlieb barbag on all the time great bit of kit.holds as much as i want it to hold and never lets a drop of water in. And what do I put in the bag, 1st photo. The 2nd photo of teh above post did not show the Thorn Accessory bar very well, so added one more photo. And if you use drop bars with brifters, consider your bar bag width and placement, see 3rd photo. Wow! Thank you all so much for posting your suggestions and experiences. I really appreciate reading about your choices of barbag and what you carry in them. I'm inclined to choose a larger type bag that is compartmentalised and has some sort of quick release system. I like the idea of being able to access a bag whilst on the move so a front to rear opener appeals. I'm also mindful of a barbag not impinging upon a front light system so Thorn's accessory bar might be a quite useful aid in this regard. I like the idea of being able to access a bag whilst on the move so a front to rear opener appeals. I have an Ortlieb 5, which opens from the rear. However the snaps which keep the lid closed are rather tight, so it is difficult to open or close the bag while riding. Maybe other people can manage it, but not me. It is easy to open/close while stopped. Another reason for opening on the rear is better protection from the rain. With a front-opening lid, it is possible that the wind could push the water into the bag. I'm also mindful of a barbag not impinging upon a front light system so Thorn's accessory bar might be a quite useful aid in this regard. If your bike is big enough, you can use a Thorn accessory bar to mount the bag above a crown-mounted light and below a bar-mounted light, if you want to use both types of lights. That's what I do. I'm 6'0" tall and have a 590L Nomad. The accessory bar is mounted at the lowest part of the steerer, just above the headset. My dyno-powered light is mounted on the fork crown, and I have battery-powered lights mounted on my handlebar. I use both kinds of lights because I commute in dark rainy weather and I want to be seen. The batteries for my bar lights are in the handlebar bag. Very convenient. Another benefit of the accessory bar is that it acts as a clamp on the steerer, so that is possible to remove the handlebars without having the fork fall out of the headset. If you want to adjust your handlebar up or down by removing/adding spacers below the stem, you can do it easily. You can buy a locking headset spacer for this purpose (https://www.sjscycles.co.uk/headsets/problem-solvers-locking-headset-spacer-for-1-18-inch-black), but an accessory bar works just as well. Though I prefer Ortlieb HB bags myself (and their older Ultimate 5 over the later Ultimate 6 for both the snap-secured lid and map case design...the magnets and newer map case of the 6 have proven not as good for me in my use and I much prefer the Large size for each) in the interest of fairness, I should say there are many who prefer the Arkel line over Ortlieb or Carradice so it is well worthwhile to check them out also. Beyond that, Topeak and Axion have their adherents also so you should take a look at those brands before buying. There's a number of desirable/beautiful handmade canvas-and-leather alternatives offered by Berthoud, Swift and others intended for the randonneur-touring market, but they are designed to be used with a decaleur (handlebar-stem mounted bracket of a specific type; the other half mounts to the bag) and pretty much have to sit atop a front platform rack. Still worth a look, however. Some of these other bags are only waterproof if you fit a cover...and that can make access difficult while it is raining 'cos the cover must be removed first...and then stowed later, possibly while it is still damp. Some additional data points: Ortliebs typically come with a sort of stiff foam internal divider. The 5-series was X-shaped and offered up to four divided compartments in the bottom of the bag The 6-series I also own has a divider that forms into a sort of W-shaped sine-wave making up to three compartments. The X-type can be purchased separately and used in other bags and for other applications For example, I have one fitted in my rack-top pack and it works great there. With any of the bags, it is wise to avoid the temptation of leaving the carry-straps attached while riding in case they could foul the front wheel with disastrous consequences. I ride with mine tucked inside the bag and all is well. As with Ortlieb panniers, I found it more helpful to place the zippered pouch atop the contents than next to the wall of the bag. Eases access and convenience. The Super C are super duper. If you cram it full enough, you don't need any dividers. Rain covers, yeah I have a rain cover for mine since my bags are not water proof. It is a hassle to use, but sometimes you have no choice. Mine is orange in the photo. It pretty much prevents you from using the bag. If you get the Ortlieb, I think that there has been some discussion of alternate brackets for those bags. That might also be of interest if you want to mount the bag on more than one bike. I have never seen a Carradry bag, I gave a tiny bit of thought to buying one but did not. That is one more option to contemplate if anyone has tried one.